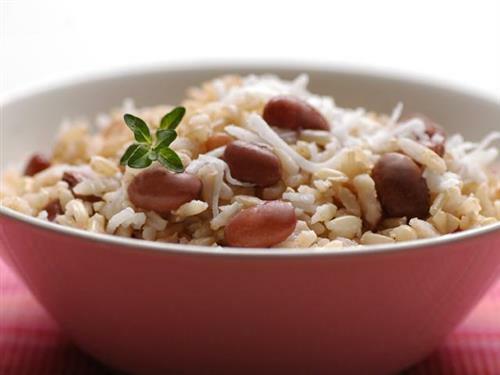 The traditional Jamaican 'Rice &amp; Peas' dish can be served with just about any type of meat. This recipe is a Sunday dinner tradition among many Jamaicans. In fact, Rice &amp; Peas on a Sunday is unofficially embedded into Jamaican culture. Drain liquid from can peas or beans into a measuring cup. Add coconut milk to the measuring cup. Make sure there are at least 3 1/2 cups of liquid in the measuring cup. Add water if necessary. Pour liquid from the measuring cup into a saucepan. Add beans/peas, onion, garlic, chicken bullion, thyme, and butter/margarine. Add rice to the mixture. Stir well. Place whole scotch bonnet pepper in saucepan without bursting it. Reduce heat to low, cover tightly, and simmer for approximately 25 minutes (or until water evaporates). Remove whole scotch bonnet pepper and serve.